Before you know it, the school bells are ringing, and it’s time for the kids to head back to school. Do you have your back-to-school routine planned out? Personalize your family’s routine with help from the following ideas. Once you have a method in place, your family will start the new school year on a bright and less harried note. Don’t wait too long to establish your back-to-school routine. The longer you wait to get your children into the habit of going to bed at a set bedtime, for example, the harder it will be for your children to get up for school in the morning. It’s not unusual for parents to allow their children to stay up later during the summer than during the school year. If you’ve been lax with making your children go to bed at a regular time, you may want to start making changes now. Expect your children to complain and try to stay up later, but the earlier they get to bed, the more prepared they’ll be for school. It will be much easier to decide what time your children need to go to bed if you know what time they have to get up in the morning. Most experts agree that children need between 9 and 10 hours of sleep each night to be at their best, while 8 hours is the absolute minimum. For example, if you know that your child must be up by 6 a.m. to be ready for school by 7:30 a.m., your children should be getting ready for bed around 7:30 p.m.
A couple of weeks before the first day of school, put your kids to bed a little earlier each night (in half-hour increments) until they are used to their earlier bedtime. The sooner you start this process, the easier it will be for them to get used to going to bed early again. Explain to your children the importance of getting a good night’s sleep. Tell them that it is during sleep that the body heals itself. Getting enough sleep will give them the energy that they need to stay awake during the school day. A good night’s sleep also lessens crankiness, which makes them easier to be around! Get your children in the habit of following a routine every night. If they choose their clothing for the next day, take a bath, brush their teeth, and get into their pajamas every night before they go to bed, you’re transitioning them into settling down. Having a set routine such as this, or any schedule you use as a family, will give them a strong sense of consistency and help them wind down. This process can also reduce complaining from your kids about bedtime. Older children are often allowed to stay up later than younger children, but this doesn’t mean that they should be permitted to stay up too late. Have them follow the same routine – choosing their clothes, taking care of their personal needs, and going to bed earlier than usual – so that they’ll be ready to get a good night’s sleep. Since they’ve taken the time to choose their clothing the night before a school day, you won’t be faced with questions like, “Mom, have you seen my blue shirt?” or “Mom, where are my sneakers?” Preparing like this makes the next morning flow much more smoothly. Once the children are in bed, dim the lighting in their room to a comfortable level. Take this time to enjoy one-on-one time – depending on their age, read them a bedtime story or have a chat about something that happened that day or about something that they want to talk about. Talk to them about the next day. What activities are planned? Do they have a doctor’s appointment? Will you pick them up from school at an unusual time? What do you have to do after they get home from school? Do you have to run to the store or take care of other errands? Anything you can do to prepare them for the next day will make things easier for the whole family. When it’s finally time for bed, tell your child that you love them, kiss them goodnight, and turn out the lights. Older children may be allowed to sit up and read quietly for a little while before lights out. Take this time to prepare for the day ahead and relax. One item you may want to purchase for your children at the beginning of the school year is an alarm clock. By giving your child an alarm clock, you’re giving them some of the responsibility in getting up on time. Does this mean that you won’t have to nudge them to get them out of bed when school first starts? Most likely not; in fact, chances are you’ll have to remind them over and over to get up, get dressed, and eat so that they can get to school on time. It may be best to wake children up early the first week or so of school until they’re able to rise and get ready by themselves. As they become more accustomed to their new schedule, you can let them sleep a little later. Remember, you want your kids to have ample time to get dressed, eat breakfast, and gather their things before they head out. If they ride a school bus, they need to be ready when the bus comes. However, if you take them to school, they may have a little more flexibility in their morning routine. Older children may not need pictures, but having a list of what they need to do each day is still helpful. Post a list in several places around the house, such as their bedroom, the bathroom, and the refrigerator so that they don’t have to keep running through the house to figure out what’s next. Place the list in a sheet protector so that they can cross or check the items off. Medical experts and nutritionists espouse the benefits of eating a healthy breakfast every morning. Not only does breakfast give the body the energy it needs after a relatively extended period of not receiving nutrients, but it also helps with focus. Eating breakfast improves a child’s concentration and allows them to perform better in school. If your child doesn’t want to eat a full breakfast, find foods that they can eat quickly, but that will still provide the nutrients their body needs. Most experts recommend eating a serving of protein first thing in the morning. Scrambled eggs on toast, yogurt and fruit, or a peanut butter and jelly sandwich on whole wheat bread are good options for breakfast. It’s okay to be creative! 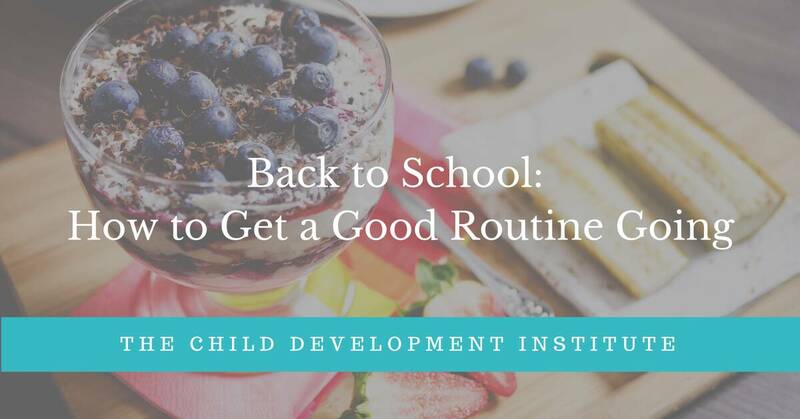 When summer is over, and it’s time to return to school, having a solid routine in place can be a blessing. Routines help us to know what to expect every day, stay organized, and prepare for the next day. Children may balk at the prospect of returning to school in the fall, but they’ll soon get back into the swing of things. Before you know it, your home will be running smoothly.